Comment: its a 40 foot slump rock retaining wall for my ewe trees along the fenceline with a fence behind the trees allowing only approx. 2 feet of dirt before the retaining wall. The retaining wall is 30 years old and in need of either repair or replacement. Im thinking of a block wall , 2 high with a cap and 38-40 feet long. Having some backfill of dirt to make it straight again. Comment: In the back yard I have a short retaining wall made of mostly slump rock. Which is approx. 30 years old. Some of them have cracked (couple) and some have broken at the mortar area. The wall is leaning out at the top due to our ewe trees maturing. Want to repair or I think put blocks 8x16 and remove the slump rock which is 4x16 I think. The wall itself is approx. 38feet long and 16 inches high or 18 inches high. Not a lot of room as its the walk area around a pool in the yard as well. Comment: Need a retaining wall around the front yard to level the grass. Also need plants and irrigation. Citrus Heights Brick & Stone Masonry Contractors are rated 4.87 out of 5 based on 123 reviews of 9 pros. 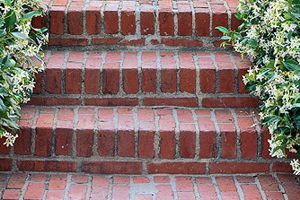 Not Looking for Brick & Stone Contractors in Citrus Heights, CA?